Let Austria put your pedals in a spin. Delight in the Danube. Love the lakelands of the Salzkammergut. 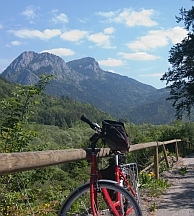 Or simply savour the greenest secrets of gentle cycling down in the Mur River Valley. From Mozart’s Salzburg to Strauss’ Vienna, from the entire backdrop of the Sound of Music to the meandering blue Danube, Austria is a firm favourite, classically scenic and wonderfully entertaining. Delve deeper though and ‘Little Canada’, Graz and the Styrian Wine Road down to the edge of Slovenia is yours to discover too. 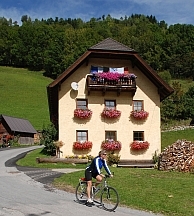 Our self-guided cycling breaks in Austria feature both linear and circular routes and include hotel to hotel cycling tours plus bike and boat holidays. Welcome to Austria's best-kept cycling secret. Starting in 'Little Canada’, surrounded by the highest mountain peaks, pedal away from St Michael im Lungau through a National Park rich with birdlife to the buzz of Graz, the lively capital of Styria. Forests, farms, fertile plains and trailing vineyards mark this amazing tour through hidden Austria. Enjoy cycling mainly on a dedicated cycle path in countryside which is practically downhill all the way. In Salzburg, St Michael im Lungau, Murau, Judenburg, Bruck and Graz. Why not indulge in a comfortable cruise down the Danube on a bike? We’re convinced that this classic cycle route has to be one of the best in Europe. The magical meanders, the valley itself and the vineyards make for the most impressive and inspiring scenery. Start in Germany and head into Austria: Passau, Linz and Vienna are packed full of rich cultural offerings and with Richard the Lionhart’s Schloss Durnstein and the amazing monastery at Melk along the route, variety is firmly on the agenda. The cycling is mainly traffic-free and bike ferries allow you to skip between the paths on both sides of the famous river. And if you fancy a day out of the saddle, that’s no problem thanks to the numerous boats and river-hugging, cycle-friendly railway. Upgraded accommodation is now available on this tour please ask for details. In Passau, Schlogen, Linz, Grein, Maria Taferl, Traismauer and Vienna. If stunning scenery and time for reflection are for you, Austria’s amazing lake district- the Salzkammergut – is right up the cycle path. Start in the wonderful city of Salzburg on a circular route which blends everything from culture to caves, roofscapes and landscapes, sheer confection and awe-inspiring natural beauty. Hallstatt, St Wolfgang, the haunting beauty of Traunkirchen... prepare yourself for the most breathtaking vistas in Europe. Flat lakeside tracks and quiet country lanes across rolling hills make for great cycling and we even ensure that the boat and train take the strain in places. Extra nights can be added anywhere on this tour, if you wish. In Seeham, Mondsee, Traunkirchen/Ebensee, Bad Goisern/Bad Ischl, Abersee/St Wolfgang and Salzburg. 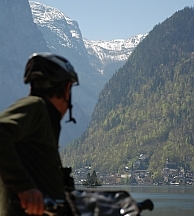 Welcome to Austria's best-kept cycling secret. Starting in 'Little Canada’, surrounded by the highest mountain peaks, pedal away from St Michael im Lungau through a National Park rich with birdlife to the buzz of Graz, the lively capital of Styria. Forests, farms, fertile plains and trailing vineyards mark this amazing tour through hidden Austria down to the borders of Slovenia. Enjoy cycling mainly on a dedicated cycle path in countryside which is practically downhill all the way. In Salzburg, St Michael im Lungau, Murau, Judenburg, Bruck, Graz and Mureck. The Danube is one of the great cycling classics, so why not enjoy it in real style by combining it with a relaxing cruise experience? Setting off from Passau, the famed City of Three Rivers, the MS Normandie or MS Arlene II cruise ships will be your hotel and guide along the illustrious Danube to waltz capital, Vienna, and back again, stopping to let you explore stretches of the magical river valley with its castles, vineyards and World Heritage Sites by bike. 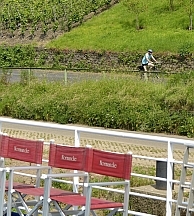 All cycling itineraries are optional and there are some on-board activities and excursion opportunities (payable locally), making this a great tour to enjoy with friends or family who’ll love sharing this iconic experience, but might prefer just to dip a toe in the water when it comes to exploring on two wheels. On board the cruise ship MS Normandie, or MS Arkona in a standard, outside-facing 2 bed cabin with private facilities and air-conditioning . Experience four countries, four vibrant historic cities and Europe’s best-loved river valley on a relaxing cruise down the Danube dotted with excellent opportunities for some superb stretches of scenic cycling. From Passau to Vienna, Bratislava to Budapest there are world-famous castles, monasteries, vineyards and picture-perfect villages waiting to be explored at your own pace by bike, or you can simply sit back on board the comfortable MS Normandie or MS Arlene II, enjoy the stunning views and perhaps sign up for an excursion or two (payable locally). A wonderful treat of a tour to enjoy with family or friends including those who might just prefer to dip a toe in the water when it comes to exploring on two wheels. On board the cruise ship MS Normandie or MS Arkona in a standard, outside-facing 2 bed cabin with private facilities and air-conditioning. In Salzburg, St Michael im Lungau, Murau, Judenburg, Bruck, Graz, Mureck and Bad Radkersburg.